The unique color of the turquoise has made it a favorite ornamental stone and gem for thousands of years. Even today it is gaining ground. The unique color makes it a favorite for fashion-minded people all over the globe. The abundance of this gemstone means that you can easily get a high quality natural stone without breaking the bank. Which makes it excellent for a gift or simply to treat yourself to a new piece of jewelry without feeling guilty. Turquoise is a blue to green mineral. 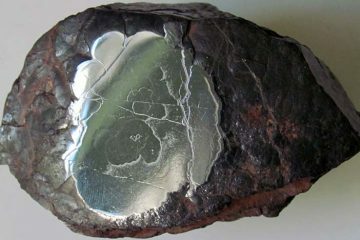 A hydrous phosphate of aluminium and copper. The mineral is quite common though gem quality turquoise is quite rare. The name turquoise comes from an old French word for Turkish as the gem entered Europe through Turkey. 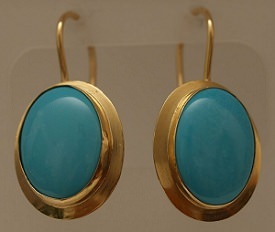 Even high quality turquoise is a very soft gemstone, only slightly harder than ordinary glass used in windows. The color can vary from white to sky blue and green. Turquoise is blue because of the presence of copper. While green turquoise can be a result of an iron impurity or dehydration of the stone. Turquoise is mined all over the world. Iran and the surrounding region has been a major source for thousands of years. Sinai used to be a large source as well, especially during the reign of the Pharaohs. Today it is no longer economical to mine on a large scale, though groups of Bedouins still mine on a small scale. Parts of the United States have rich deposits as well. Particularly the south-western parts such as Arizona, Colorado and California. New Mexico was home to some of the oldest mines in the US, being mined by Native Americans, though today they are considered exhausted. Most of the turquoise mined in the US is of a low quality that is mainly a by-product of other mining activities such as copper mining. However several mines in Arizona are famous for their unique color called sleeping beauty turquoise that can be seen in the image above. They are considered the highest quality turquoise being produced today. From the Aztecs to the ancient Egyptians they all used large quantities of this material in artworks and turquoise jewelry. 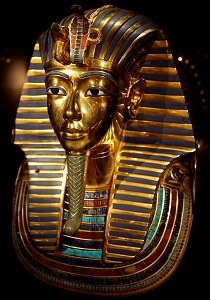 The gold burial mask of Tutankhamun for example was inlaid with turquoise. In Persia it was considered the national gemstone for thousands of years, decorating important buildings such as mosques. This style was later exported to India where it can be found in the Taj Mahal. Turquoise became so popular in Ancient Egypt that it supposedly was the first gemstone to ever be imitated. A glazed ceramic was produced that was far cheaper and easier to obtain. It took until the 14th century until turquoise, both in mosaics and as a gemstone, became popular in Europe. The reason for this was that the Roman Catholic Church used it as a clergy gemstone. Once the influence of the church declined turquoise rings and necklaces were quickly worn by the secular public. For most of its history turquoise was thought to protect the wearer and warn of impending danger by changing color. Turquoise can indeed change color, but it is likely that this is caused by prolonged wearing. 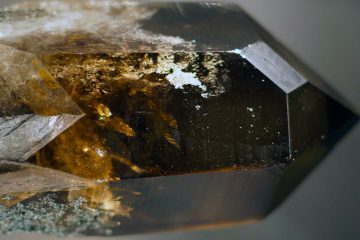 Oil and acids from the skin can enter this porous stone, direct sunlight for long periods of time is a probable cause as well. 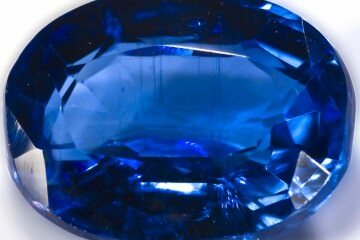 Because of its low hardness you should be extra careful with this gemstone. Dropping your turquoise gemstone could result in dents and scratches. It might even shatter if you are unlucky. Cleaning with an ultrasonic jewelry cleaner or a steam cleaner should never be done. The stone could break or change color due to the porosity of turquoise. Keep it away from make-up, perfumes and jewelry cleaning products. The best way to clean your gemstone is to just use lukewarm water using a soft brush if needed. Thoroughly dry the stone before you store it in your jewelry box or drawer. As with most gemstones there are imitations on the market. Though in the case of turquoise it is very widespread, perhaps even outnumbering real turquoise. An example of a gemstone used to imitate turquoise is howlite. 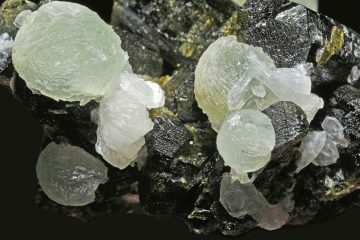 Gemstone treatments are very common. Strengthening the stone with epoxy or plastic resin, dyeing the stone, heating the stone to increase its durability, waxing. Almost every enhancement known to man is used on turquoise. Be aware that Oriental turquoise, while having a nice name, is nothing more than pulverized turquoise pressed together with glue to form a new stone. All these treatments will enhance your stone which is quite nice as natural turquoise can lose its color and shine quite fast. However a lot of dealers will not disclose their treatments and will sell you a gemstone that is vastly overpriced. Even though turquoise is quite cheap, I would still only buy from a reputable dealer. The risk of overpaying or buying a low quality stone that will quickly lose its appeal is simply too high for my taste.